For any Skatter to occur we only need a surface and objects to skatter on that surface. Below you can see I have 2 components with an assortment of grasses in each component. I also have some lose indidividual objects to introduce to the surface to add more variation later. First we pick our surface as the host and then our Grass Assortments as the scattering objects this tells Skatter where we want to our objects to appear. So far so good but the distribution of the objects is not giving us the result we need. We can fix this in the Distribution panel in Skatter. Here you need to change the type to Random and set the items per unit value accordingly. I also turned on Collision and set the size multiplier to 5%. A low value to keep the grass closely bundled. In this example I'm scattering on a 1m square and at the bottom of the Skatter dialog you can see it is generating over 1600 objects on the surface. There's a downside to using Random and Collision on larger surfaces, as it can become really slow as the number of objects increases. But Skatter compensates if you use Uniform and reduce the X and Y spacing plus play around with the jitter settings. Here I aiming for maximum affect in a small space but in a larger area you need to be mindful of using the Random Distribution. Under the Area tab I set the Boundary Check to Distance with a value of 10. This is so the scattering will stay within the surface. I also introduce some random rotation and scaling to increase the variation of the scattering. Skatter integrates with various Rendering Applications to minimise overhead in SketchUp. To take advantage of this I'm using Thea Render to read the Skatter Settings and render the scene without the need to introduce thousands of objects into the SketchUp viewport. So I name my Skatter and click reGenerate to commit my settings then I do a test render with Thea. Thea has the added advantage of rendering directly in the SketchUp viewport so I get instance feedback on the result so far. I use Thea's Interactive Presto rendering engine as it is extremely fast and utilises GPU to render in seconds. To add more variation I add the individual grasses but reduce the amount of the random scattering significantly. We don't want to many just enough to break up the pattern. To create a new Skatter click the toolbar icon and pick your host surface and objects. Adding random rotation and scale is important plus generating a new seed value means I get a different distribution than our first Skatter. Another test render in thea and we can see this new scattering of light coloured ryegrass has introduced the variation we see lawns. But we are still missing what all lawns have...weeds. So I create a third Skatter and import some lo-poly daisies and dandelions to help give the lawn the look we need. Tweaking the distribution and rotations as before plus making sure the scale fits the grass. One final test render in Thea we have a varied lawn with 3 grass types and some perennial weeds. The result for no real user input other than value tweaking is impressive. When you consider that in SketchUp there's no geometry other than the items we need the file size is still small. Skatter is a fantastic tool for ArchViz and we are lucky that it's developer, Thomas Hauchecorne, has given Premium Members a 25% discount off this incredible tool. 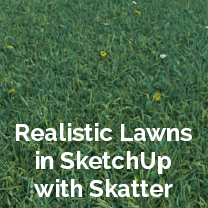 So next time you need to make that perfect lawn there's no better place to start than with Skatter. But what does this do to how smooth the model operates? Wouldn't adding that many lines totally bog down the OS? If you use the Render Only option then your rendering app is doing the processing. For larger areas the Uniform method is a better approach.